SunTech - ADL Data Systems, Inc. Automated BP devices have become routine for blood pressure measurement. The 247™ BP + Vitals device offers SunTech®’s clinical-grade blood pressure technology in a package designed to fit easily into clinical workflows for measuring and collecting patient vital sign information. 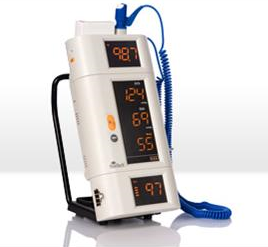 With its modular design, start with blood pressure and add other parameters such as temperature and SpO2 when needed. Additionally, the SunTech 247 comes in a variety of mounting options so you can use it wherever, whenever and however you like. A 247 Diagnostic Station equipped with the optional Bluetooth™ capability can send blood pressure, temperature, and oxygen saturation data via a Bluetooth™ wireless EMR/EHR interface. Power External power supply, p/n 19-0013-00 or equivalent approved by SunTech. Input: 100-240V AC @ 47-63 Hz. Output: 6V DC @ 15W.